Used as a stand alone support or placed in one of our cube planters this will add, height to your flower bed or an extra element to the planter. 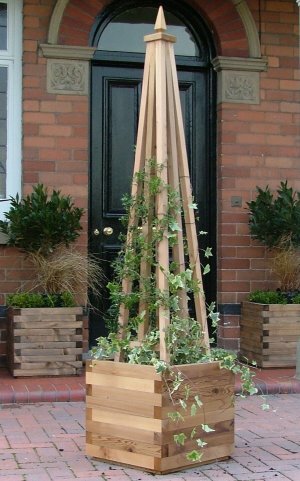 Obelisks provide excellent support for climbing plants as well as providing decorative appeal. 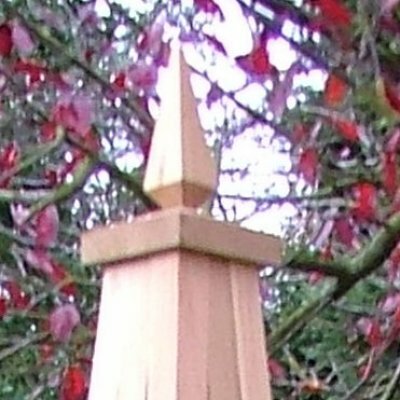 This elegant obelisk is made from lengths of western red cedar which are fixed and glued together so it will stand the test of time. We also supply all our obelisks with eyelets and spikes to secure them to the groundt. You can only use these if you are positioning the Obelisks on soil or grass. For many kinds of garden, big as well as modest, set to grass or maybe the tiniest terrace, there are numerous methods for making your garden appealing to prospective buyers, and one of the most least expensive would be to invest in obelisks. gardens like the ones at RHS Rosemoor as well as Cockington Court. Both gardens have got tower-like obelisks crafted from wood, linked with rope swags along which the roses may ramble. Even during winter these kinds of structures produce a genuine statement of splendour and old world charm. The kind of obelisk you decide to put into your own garden in order to make it more pleasing to homebuyers depends on the size of the property and also the garden. 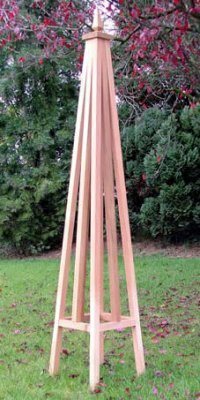 A large Victorian house garden with deep herbaceous borders will probably benefit from tall trellis pyramid-shaped obelisks having classic finials, crafted in plain wood, or perhaps coloured in a variety of subtle painted shades of soft green or blue.